Cuttlefishes are small to medium-sized ceph-alopods distributed on continental shelves and slopes throughout most of the world’s oceans. There are over twenty hundred species of cuttle-fishes currently recognized, grouped into five families from which the family Sepiidae is the most important for artisanal and industrial fish-eries. The most important genus exploited is Se-pia which contains more than hundred species (Jereb and Roper, 2005). Cuttlefish is commer-cially fished and consumed by humans. Its ink has many uses including homeopathic medicinal uses and used as dyes and paint. Many people keep cuttlefish as pets. People often give cuttle-bones from cuttlefish to their pet birds as dietary supplements and to keep their birds' beaks in good health (Dunlop, 2003; Wood, 2009; Davis, 2010). Cephalopod fishery (cuttlefish, squid and oc-topus) is economically very important for Oman, due to their high commercial values on national and international markets. Cuttlefishes constitute about 16% of the total demersals’ catch in Oman coastal waters (Fishery statistics book, 2011). The cuttlefish catch in the Oman coastal waters is composed of at least four species from which S. pharaonis and S. prashadi are the major ones while the other two species are of lesser im-portance (S. omani and S. arabica). Hooded cut-tlefish Sepia prashadi, is a demersal, shallow water, small-sized species ranging in depth from the coastline to 200 m. It is widely distributed in the Indian Ocean from northeastern India to the Oman Sea, Red Sea, Gulf of Suez, southern Mozambique, Madagascar, Mauritius and Anda-man–Nicobar Seas. Despite the great importance of cuttlefish in the Omani coastal waters, only three studies were carried out on those species. Meriem, et al. (2001) made a stock assessment study on the pharaoh cuttlefish collected during 1999 from Oman Sea, while Al-Marzouqi et al. (2009) car-ried out biological and stock assessment study on the same species collected during 2001-2002 from the Arabian Sea and recently Mehanna et al. 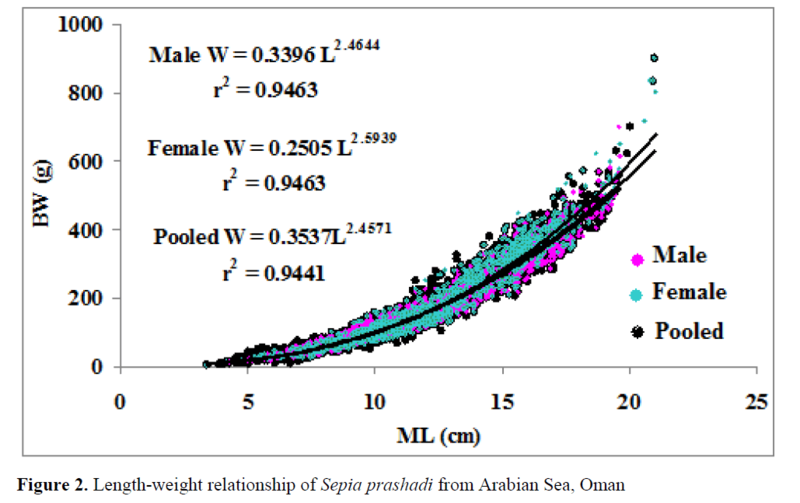 (2012) assessed the fishery status of the S. phar-aonis collected from Arabian Sea during 2007-2008 and 2011-2012. For cuttlefish stock assess-ment and management, studies on their fisheries status and population dynamics are urgently re-quired. The present study is the first to estimate the basic parameters of S. prashadi stock in the Arabian Sea for the purpose of conservation and improving its future production. The mantle length - weight relationship was estimated using the power equation W= aLb where W is the total weight, L is the mantle length. The growth parameters (ML∞ and K) were esti-mated using Powell (1979)-Wetherall method (1986) which gave an estimate for the ML∞ and Z/K and ELEFAN I method (Pauly, 1987). Bhattacharya (1967) method incorporated in the FiSAT software to discriminate the age groups and then using the Ford (1933) - Walford (1949) plot to estimate the growth parameters. Growth performance index φ’ in terms of growth in length was estimated to validate the growth parameters (Gayanilo and Pauly, 1997). Beverton and Holt (1956) equation and Length converted catch curve method of Pauly (1983) to estimate total mortality coefficient Z.
Pauly's formula (1980) and Rikhter and Efa-nov method (1976) to estimate natural mortality coefficient M.
The fishing mortality coefficient F was com-puted as F = Z – M, while the exploitation rate E was computed from the ratio F/Z (Gulland, 1971). The relative yield per recruit (Y’/R) and rela-tive biomass per recruit (B’/R) were estimated by using the Beverton and Holt model (1966) as modified by Pauly and Soriano (1986). The estimated b-values were significantly dif-ferent from 3 indicating negative allometric growth where b < 3 (CI= 2.42-2.47 for males and 2.57-2.62 for females). The same finding was ob-served by Imam (1994) who estimated the ML-BW relationship for S. prashadi sampled from Gulf of Suez as W = 0.4993 L2.456. The ML in his study ranged from 56 to 124 mm and the BW varied between 35 and 238 g.
Age was determined based on pooled length–frequency data using the Bhattacharya's (1967) method (Fig. 3). It was possible to identify two components which were considered as distinct age groups or cohorts for S. prashadi. The Bhattacharya method was also used to analyze the monthly length frequency data to obtain the mean length and number of individuals in each month. The ML corresponding to different months was 6.11, 11.89, 16.33 and 18.86 cm for 6, 12, 18 and 24 months old and the bulk of catch was belonged to age group of 12 months old (69%). The maximum growth rate was recorded during the first six months of life for ML and at age of 18 months for BW using length-weight relationship to convert the length by age to weight. These results are in close agreement with the findings of Emam (1994). He found that the longevity of S. prashadi in the Gulf of Suez was 18 months and rate of growth in length is much higher in young individuals than the old ones. First estimates of the asymptotic length (L∞) and the ratio between the coefficients of total mortality and growth (Z/K) obtained from Pow-ell-Wetherall plot were 23.8 cm and 5.75. Subse-quently the estimates of L∞ was used in ELEFAN I and the parameters obtained by this method are L∞ = 24.3 cm and K = 0.86 per year (Fig. 4). Alt-hough the growth parameter L∞ could be esti-mated using ELEFAN I program directly, the Powell-Wetherall method was used to facilitate the identification of K-value compatible with the value of L∞ which is more reliable than when this parameter is estimated together with L∞ (Pauly, 1986). The mean lengths obtained from Bhattacharya method were applied to the Ford (1933)-Walford (1949) plot to estimate L∞, K and to. The values obtained were L∞ = 24.1 cm, K = 0.81 per year and to = -0.14 year. Results of the ELEFAN I program compare well with those of the Bhattacharya analysis. The growth performance index Ø’ values were estimated as 2.71 for ELEFAN I parameters and 2.67 for Ford-Walford parameters. The two values were within a very narrow range indicat-ing that all estimates from the two methods pointed towards similarity in the growth pattern. The growth parameters of non-linear least square method were used for subsequent calculations of stock assessment. Beverton and Holt equation gave an estimate of Z = 3.62, this value is closed to the value of Z obtained using length – converted catch curve analysis (Z= 3.71) (Fig. 5). The natural mortality coefficient calculated from Pauly’s formula using mean annual water temperature of 26°C was 1.6 per year. Rikhter and Efanov method gave an es-timate of M = 1.49 per year. The mean values of Z and M gave a value of fishing mortality F = 2.12 and exploitation rate E = 0.58. Relatively high values of fishing mortality and exploitation rate reflect the high level of exploitation. The higher level of exploitation may be due to the in-creasing of fishing effort targeting the cuttlefish fishery during the recent years, where the number of fishing boats operating in the Arabian Sea in-creased by 36% in 2011 compared with the num-ber in 2007 (Annual fishery statistics book, 2011). The mid-point of the smallest length group in the catch of hooded cuttlefish during the survey period was taken as length at recruitment (Lr), while the length corresponding to the first value in the descending limb of the length converted catch curve was taken as the length at first cap-ture (Lc). The estimated Lr and Lc were 3.5 and 11.5 cm ML, respectively. It was observed that a considerable part of the catch was under-sized and not reaches its sexual maturation (61%). The plot of Y’/R against E (Fig. 6) gives an optimum level of exploitation rate at E = 0.74. The present level of E (0.58) was lower than that which gives the maximum Y’/R by about 28% but the raise of the current exploitation rate to this level will be associated with a negligible in-crease in Y’/R (8.8%). Both of E0.1 (the level of exploitation at which the marginal increase in yield per recruit reaches 1/10 of the marginal in-crease computed at a very low value of E) and E0.5 (the exploitation level which will result in a reduction of the unexploited biomass by 50%) were estimated. The obtained values of E0.1 and E0.5 were 0.6 and 0.36, respectively. It is obvious that the current E is higher than the exploitation rate (E0.5) which maintain 50% of the stock bio-mass. For management purposes, the exploitation rate of S. Prashadi should be reduced from 0.58 to 0.36 (38%) to maintain a sufficient spawning biomass since the maximum Y'/R is not the target point but the maximum constant yield (the maximum constant catch that is estimated to be sustainable, with an acceptable level of risk, at all probable future levels of biomass) is the target reference point for fisheries management (Caddy and Mahon, 1995). Besides, it is always safe to be on the left of the maximum Y'/R than to use its current value. It could be concluded that there is a scope to increase the annual yield of S. prashadi stock in the Arabian Sea. This can be achieved by in-creasing the length at first capture through the increase of nets mesh size. This will conserve the young individuals and give them the chance to grow up to a marketable size and reproduce at least once before catching. The results of stock assessment show that though there is scope to in-crease the effort by 20-30% to get MSY from the fishing grounds, the increase in yield will be marginal (5-9%). Also, separate catch statistics for this species and other Oman fish species is strongly recommended. Al-Marzouqi, A., Jayabalan, N.,Al-Nahdi, A., (2009). Biology and stock assessment of the pharaoh cuttlefish, Sepia pharaonisEhrenberg, 1831 from the Arabian Sea off Oman, Indian Journal of Fisheries, 56 (4): 231-239. Annual fishery statistics book (2011). Ministry of Agriculture and Fisheries Wealth, Sultanate of Oman. Bertalanffy, L. von (1938). A quantitative theory of organic growth (Inquiries on growth Laws. 2 ), Human Biology, 10: 181-213. Beverton, R. J. H., Holt, S. J., (1956). A review of methods for estimating mortality rates in exploited fish populations, with special reference to sources of bias in catch sampling. Rapp. P.-v. Reun, CIEM, 140: 67-83. Beverton, R.J.H., Holt, S.J., (1966). Manual of methods for fish stock assessment. Part 2. Tables of yield functions. FAO Fish. Tech. Pap./ FAO Doc. (38) Rev., 1: 67p. Caddy, J.F., Mahon, R., (1995). Reference points for fisheries management. FAO Fisheries Technical Paper, 347: 83pp. Emam, W. M. (1994). Stock assessment of the cuttlefish Sepia prashadi(Mollusca: Cephalopoda) in the Gulf of Suez, Indian Journal of Marine Science, 23: 35-38. Gayanilo, Jr.F.C.,Pauly, D., (1997). FAO–ICLARM stock assessment tools. Reference manual, FAO, Rome, 262 pp. GayaniloJr.F.C.,Sparre, P., Pauly, D., (1997). The FAO-ICLARM Stock Assessment Tools (FiSAT). FAO Computerized Information Series (Fisheries). No. 8. Rome, FAO. Gulland, J.A., (1971). The fish resources of the Ocean. West Byfleet, Surrey, Fishing News (Books), Ltd., for FAO Technical Paper, 97: 255pp. Jereb, P., Roper, C., (2005). Cephalopods of the world. An annotated and illustrated catalogue of cephalopod species known to date. Volume 1. Chambered nautiluses and sepioids (Nautilidae, Sepiidae, Sepiolidae, Sepiadariidae, Idiosepiidae and Spirulidae), FAO Species Catalogue for Fishery Purposes, 1(4): 1-262. Meriem, S.B., Mathews, C.P., Al-Mamry, J., Al-Rasadi, A. (2001). 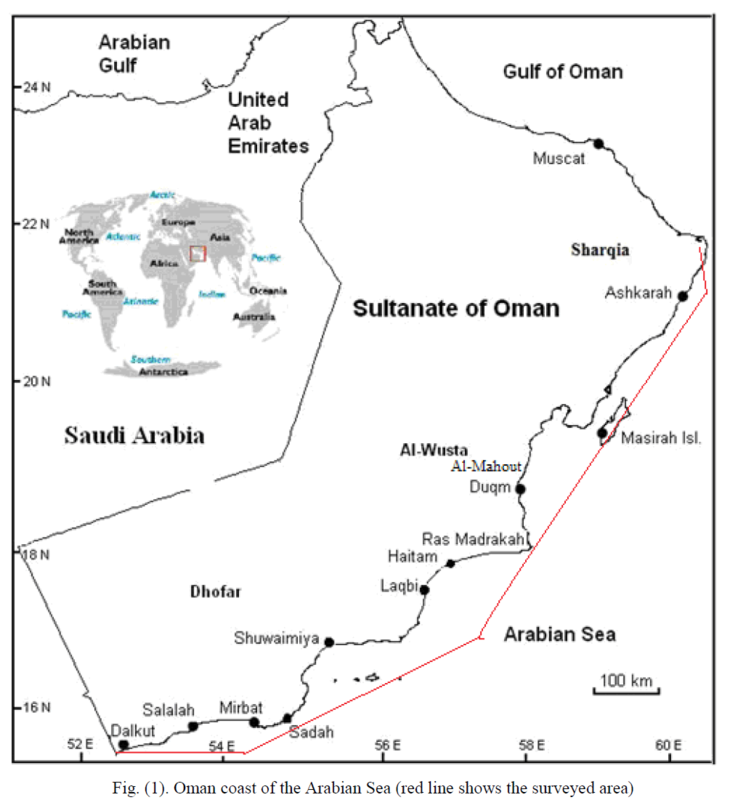 Stock assessment of the cuttlefish stock Sepia pharaonisin the Gulf of Oman. In: Goddard, S., Al-Oufi, H., McIIwain, J. and Claereboudt, M. (eds), Proc. 1st International Conference on Fisheries, Aquaculture and Environment in the NW Indian Ocean, Sultan Qaboos University, Muscat, Oman. p, 91-97. Pauly, D., (1983). Length-converted catch curves. A powerful tool for fisheries research in the tropics, Part 1. ICLARM Fishbyte, 1(2): 9-13. Pauly, D. (1986). On improving operation and use of the ELEFAN programs. Part II. Improving the estimation of L8, Fishbyte, 4(1): 18-20. Pauly, D., (1987). A review of the ELEFAN system for analysis of length- frequency data in fish and aquatic invertebrates, ICLARM Conference Proceeding, 13: 7-34. Pauly, D., Soriano, M.L., (1986). Some practical extensions to Beverton and Holt's relative yield-per-recruit model. In: J. L. Maclean, L. B. Dizon and L. V. Hosillo (eds. ), The First Asian Fisheries Forum, pp 491-496. Powell, D.G., (1979). 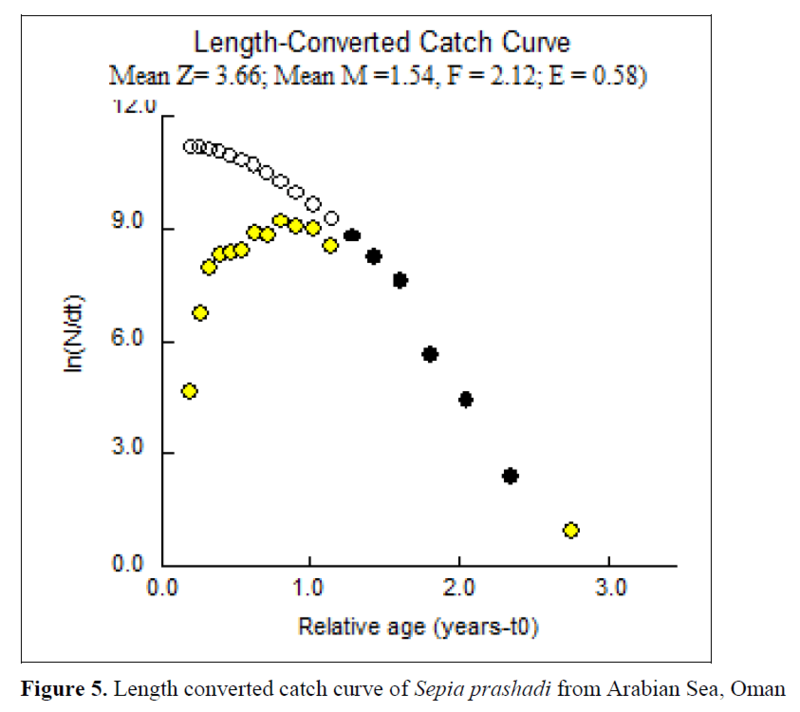 Estimation of mortality and growth parameters from the length-frequency in the catch. Rapp. P.-V. Réun. Cons. International Explorer de la Mer,175: 167-169. Rikhter, V.A., Efanov, V.N., (1976). On one of the approaches to estimation of natural mortality of fish populations. ICNAF Research Document, 76/VI/8: 12pp. Wetherall, J.A., (1986). 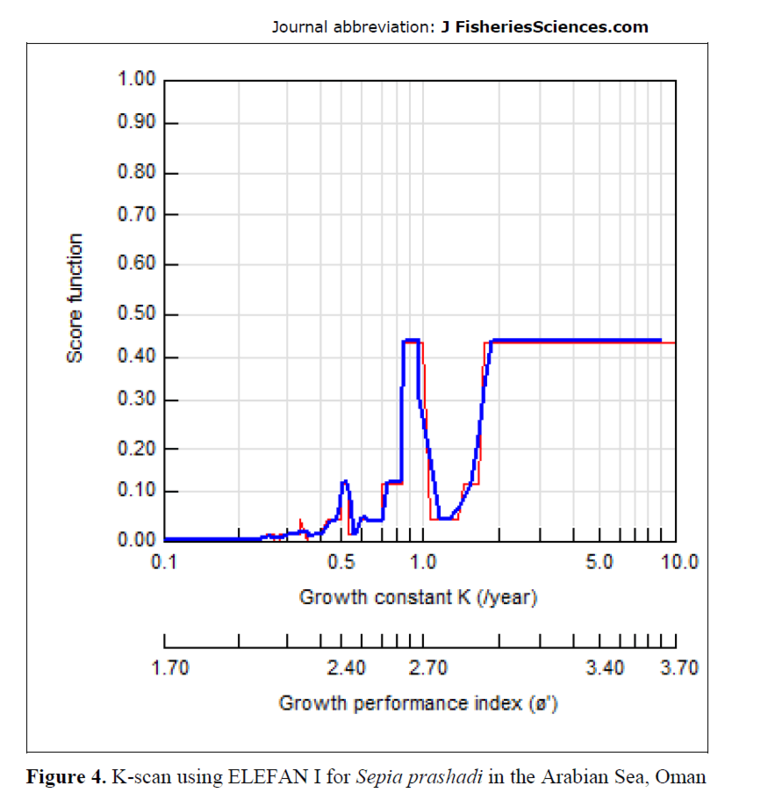 A new method for estimating growth and mortality parameters from length-frequency data, ICLARM Fishbyte, 4(1): 12-14.